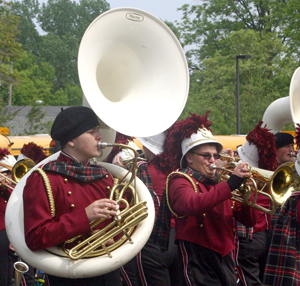 GORHAM—The Dundee school bands ended the season by claiming several first places and Class C awards at the 50th Annual Gorham Pageant of Bands last Friday and Saturday. The parade band, high school jazz band, color guard and winter percussion all won first place. The jazz band also won Best Class C Woodwind Section and Best Class C Brass Section. The middle school jazz band also claimed the Best Class C Woodwind Section. Jordan Cady won Outstanding Solo Award for playing the alto sax. The junior high concert band and junior jazz band won second place. The high school concert band and twirlers both took third place. Schools competing in Class C include Dundee, South Seneca, Kendall, Naples, Gananda and Elba.